I recently got an e-mail from a colleague in the Yasuda lab (now moving to Max Planck Florida!) about a sensor I worked on before I left. Which reminded me to write a post about it. The Yasuda lab specializes in making and refining fluorescent sensors for second messenger activity, most famous among them Ras, CaMKII, and Rho-GTPases (I remember one grant proposal where Ryohei proposed making sensors for all GTPases). My corner of the kingdom was to develop a FRET/FLIM sensor for PI3K. PI3K is a second messenger involved in LTP, and works by phosphorylating the third carbon of phosphoinositol, turing PIP2 into PIP3. Diagram of the PI3K sensor. PI3K phosphorylates the third carbon of PIP2, creating PIP3. Our sensor consisted of mEGFP tagged to the membrane via a CAAX box, and the PH-domain of Btk tagged with mCh. Normally, the PH domain is cytosolic, due to the low basal PIP3 levels. When PI3K creates PIP3, it recruits the PH domain to the plasma membrane, bringing the mCh close to the GFP, causing FRET. To detect PI3K activity, we modified an existing FRET sensor. I won't dive into the details of FRET nor FLIM here, but FRET is used to measure the proximity between two fluorophores. When the two fluorophores are distant, FRET is low, and when they are close, FRET is high. In this case, the donor fluorophore was mEGFP tagged to the plasma membrane via a CAAX box. The acceptor fluorophore was mCherry tagged to the PH domain of Btk, which selectively binds to PIP3. 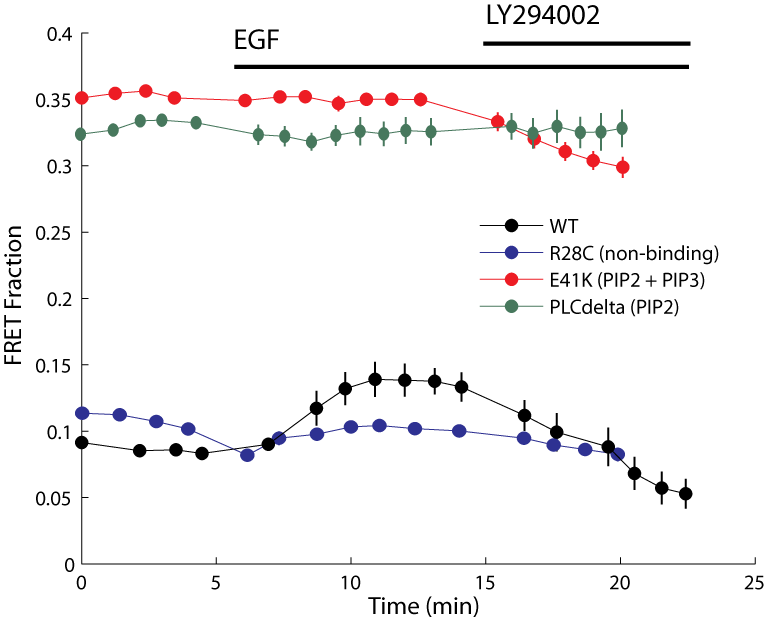 Under normal conditions, there is a lot of PIP2 at the plasma membrane, but little PIP3, which means the Btk-PH-GFP floats about in the cytosol, and FRET is low. When PI3K is active, however, it recruits Btk-PH-GFP to the plasma membrane, bringing the mCh and GFP into proximity, and causing FRET. Most of the initial sensor development was done by an undergrad, Wei Leong Chew, under my supervision. We tried a variety of different donor-acceptor combinations, including using Akt-PH instead of Btk-PH; trying different acceptors like dimYFP or tandem-mCh. It's important to have the donor at the plasma membrane instead of the acceptor (to be honest, one year later, I can't remember the specific, technical reason why; certainly it's helpful to have a consistent donor fluorescence). In any case, we got the sensor to work. To test the sensor in HEK cells, we applied EGF, which activates a wide-ranging signaling cascade, including PI3K (see below). When we did so, the cells underwent significant morphological changes, and the FRET fraction increased. Then, to reverse the process, we applied the PI3K antagonist LY294002, which caused the FRET fraction to decrease. The PI3K sensor can detect changes in PI3K activity. Left. Images from one cell. Top are the donor, mem-GFP (localized to the plasma membrane) and acceptor (in the cytosol). Bottom shows the FRET images, where blue means low activity, and yellow/red means high. Following EGF, the FRET activity increases; following LY, it decreases. Right. 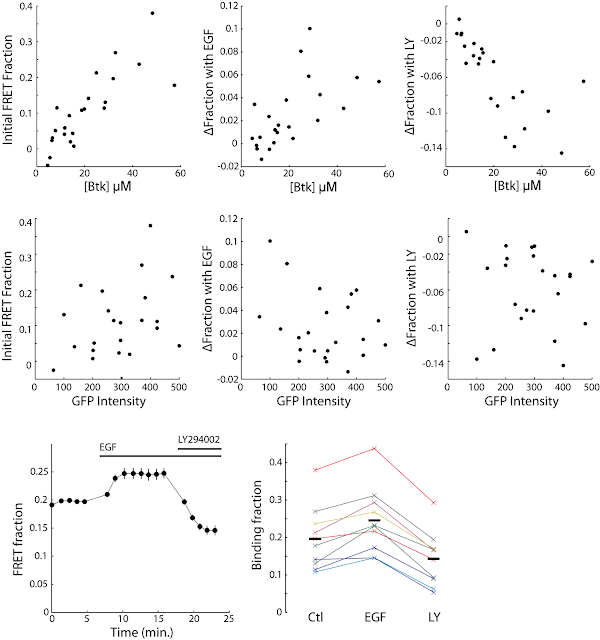 Quantification of the FRET fraction. For this cell, the FRET fraction was reduced below the basal fraction following LY application. To further verify that the sensor was detecting PI3K activity specifically, and not other phosphoinositides, we tested the sensor using a few different PH-domains. First, we tagged the donor GFP to the PH-domain of PLCdelta, which binds specifically to PIP2 (green trace, below). This sensor had a high basal binding fraction, reflecting the high basal PIP2 concentration, but was unchanged by EGF or LY application. Second, we created a point mutant of Btk-PH, E41K, which binds both PIP2 and PIP3 (red trace). This sensor had a high basal binding fraction, and was insensitive to EGF, but was reduced by LY. Finally, we created Btk-PH-R28C, which does not bind strongly to any phosphoinositides (blue trace). This sensor had a low basal binding fraction, and did not change with EGF or LY application. These experiments combined show that the sensor is PIP3 specific. The PI3K sensor is PIP3 specific. We used three PH-domains to test PIP3 specificty. PLCdelta binds PIP2 specifically, has a high basal binding fraction, and is insensitive to PI3K drugs. Btk-E41K binds both PIP2 and PIP3, has a high basal binding fraction, and is inhibited by LY. Btk-R28C does not bind any PI, has a low basal binding fraction, and is insensitive to drugs. While performing these experiments, I noticed one peculiarity. The basal binding fraction, and changes following drug application, all depended on the concentration of Btk-PH-mCh (see below). This is due to the non-specific nature of the FRET sensor. Most FRET sensors require direct binding between the donor and acceptor constructs, while in this sensor, we are relying on proximity. Thus, the higher the acceptor concentration, the more acceptor will be brought to the plasma membrane, and the higher the FRET. This would cause complications in neurons, where Btk-PH expression can occlude structural plasticity. The concentration of the acceptor effects the strength of the sensor. Top. The initial FRET fraction, and changes in FRET, are all correlated with the concentration of Btk. Middle. These same variables are (mostly) independent of donor intensity. Bottom. Population average timecourse for high-Btk expressing HEK cells. PI3K is active in stimulated spines. Left. Structurally plasticity of spines stimulated by glutamate uncaging. Initial structural plasticity was strong, but the late-phase was less than normal (we did paired uncaging to confirm this). Right. Change in FRET activity in the stimulated and adjacent spines. The sensor was active in the stimulated spine relatively rapidly, and stayed elevated throughout. I measured FRET activity in the stimulated spine, nearby dendrite, and adjacent spines. In the stimulated spine, there was a relatively rapid increase in activity which persisted for the duration of the experiment (above right). This activity did not seem to spread into the dendrite or adjacent spines (data not shown). This is in comparison to CaMKII, which is spine-specific but short lived, and Ras, which is longer-lasting, but not spine specific. That's the last of my unpublished data from the Yasuda lab. In retrospect, the story doesn't seem far from some version of complete. The neuronal data just needed some refinement to get more consistent results (the n above is quite low). At the time, though, after seven years in Durham, I was impatient start the next phase in my career. If I was more strategic, I probably would have finished it. I know a couple people are still working on the sensor, trying to get it to work without interfering with structural plasticity. You can probably look forward to a more expanded result in the near future (1-2 years).